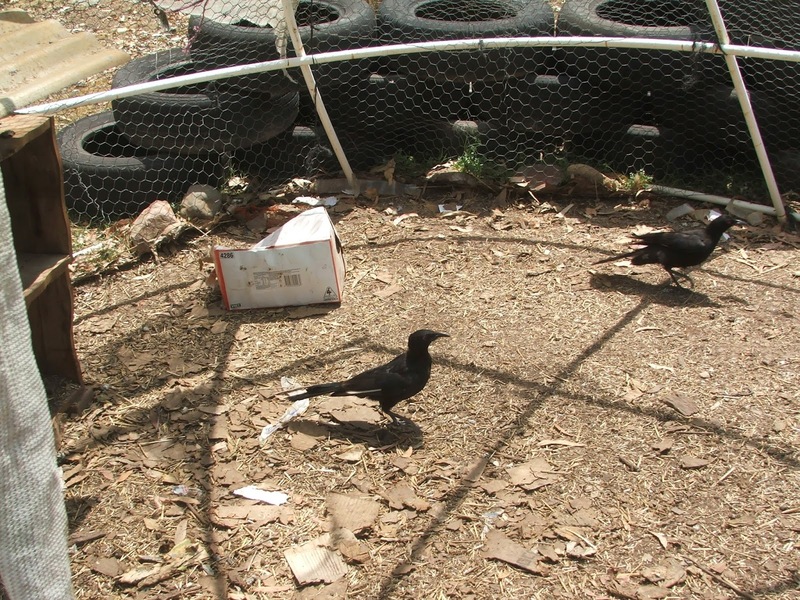 We frequently have some noisy visitors to the animal pens; white-winged choughs. These funny little birds are often mistaken for crows by people who have never seen them before. 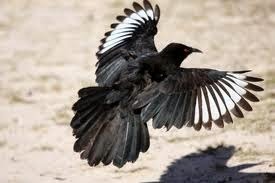 They are mostly black with a white spot on their wings which is only visible when flying. They eat insects and seeds; which is why they love our place. They forage for food on the ground, but always leave a lookout in a tree to watch for predators (which includes me in their eyes). The group we have here is relatively small; only eleven members this year, but they are often seen in flocks of 20 or more. They are social birds and spend long hours feeding and caring for the juveniles in the flock. I often find a few choughs in a chook pen, eating happily with the chooks. They seem to help keep the fly population down too and watching them chase a stinging fly over the yard provides many laughs. These two were eating grain this morning when I went to feed the chooks. I love having birds visit the humpy. Have you seen choughs at your place?